Joseph City (elevation 5,000 ft) is an unincorporated community located in Navajo County, Arizona, United States. 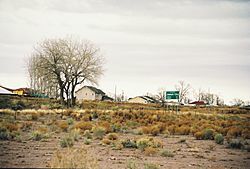 It is located on Interstate 40 about eighty miles east of Flagstaff and about thirty-five miles west of Petrified Forest National Park. In 2010, there were 1,386 inhabitants. It is the site of the Jack Rabbit Trading Post, a famous Route 66 landmark. Joseph City was settled in 1876 by colonists from The Church of Jesus Christ of Latter-day Saints. This band of 73 pioneers was led by Captain William C. Allen. They traveled to the Little Colorado River basin of Arizona. Joseph City was one of four Little Colorado River colonies. The other colonies were Brigham City, Sunset, and Obed. Joseph City is the only remaining colony. The hardest trial for the new colonists was trying to get water for their crops. This meant that they had to try and tame the Little Colorado River. This was difficult due to the flooding season that would destroy dams along the river.The first dam was built in 1876, shortly after the colonists arrived in the area. For the next eighteen years the colonists built ten more dams. The eleventh dam was built in 1894. This dam lasted for twenty-nine years. In 1923, the eleventh dam was destroyed and the colonists were forced to build a new dam. This dam still currently stands and directs water to the inhabitants still in the city. The name of the colony changed two times since its colonization. The area settled by Captain Allen's group was called Allen's Camp, in honor of their leader. There was a name change in January 1878 to St. Joseph. This change was brought about when the Little Colorado Stake was organized. This name was suggested in order to honor Joseph Smith founder of the Latter Day Saint movement. In 1923 there was a final name change to Joseph City. Due to mail and freight shipment confusions, the Santa Fe Railway, that also ran through Saint Joseph, Missouri, asked that St. Joseph, Arizona change its name. The residents of the town voted and the name became Joseph City. Joseph City is located at (34.955833, -110.333889). According to the United States Census Bureau, the city has a total area of 7.41 square miles (19.2 km2), of which, 7.4 square miles (19 km2) of it is land and 0.01 square miles (0.026 km2) of it is water. Joseph City has a semi-arid climate (BSk) with cold to cool winters and hot summers. Although the mean snowfall is 0.16 metres (6.30 in), the median is zero, so the majority of winters do not have measurable snow. Joseph City, Arizona Facts for Kids. Kiddle Encyclopedia.